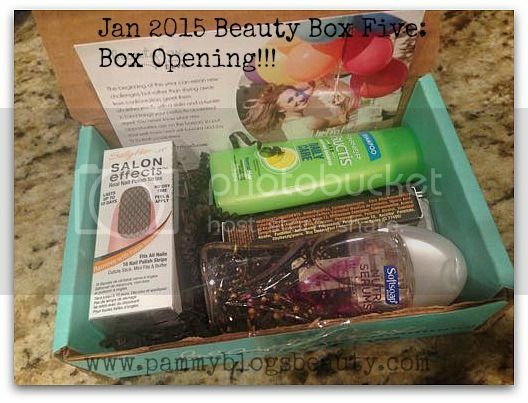 Pammy Blogs Beauty: Beauty Box Five: January 2015 Box Opening! Beauty Box Five: January 2015 Box Opening! Hey Beauty Box lovers and fellow Beauty Box Five subscribers! It is time for another Beauty Box Five box opening post! :) As a huge fan of beauty sample boxes, I literally can't wait to open my various box subscriptions every month! With the new year, I am all about trying out new products and discovering new brands! So, do you want to find out what is in my December 2015 Beauty Box Five Box? Please click "read more" below to find out! Beauty Box Five reminds us that a new year is all about fresh possibilities! You just never know what new opportunities might be on the horizon. It is exciting, really! So, Beauty Box Five is encouraging its box subscribers to put your best self forward. These products are just what you might need to freshen your look! Coastal Scents | Eye Shadow (full size shadows and palettes retail from $1.95-$24.95): Oh how cute! A mini sampler quad of Coastal Scents shadows. The assortment I got has the following shades: mint condition, sundried, stone cold, and wild raisin. I love the shades: all brown neutrals with a pretty pop of mint! I already have some Coastal Scents shadows in my makeup collection and this is a nice reminder to use them! They really are good quality and pigmentation considering the low price! If you have never checked out Coastal Scents, I highly recommend checking them out...especially if you are just getting started in makeup. It is a great way to build up quite a variety of shadows in so many colors at a great price! Sally Hansen | Salon Effects (full size retails for 9.99! This is a full size sample, yay! ): How funny, I have used this exact pattern before. I love it! Very elegant and pretty (pattern: Misbehaved, it looks like a fishnet black lace over a neutral shimmer). This is a great way to get the look of nail art, with no mess! These wear great, too. I am totally thrilled with this sample! Ultrafresh | The Gold Standard Mascara in Blackout: (full size retails for $21.00): What a fancy-schmancy looking mascara with its sleek gold packaging. Ladies, I can always use another mascara! Can't wait to try this. I have never heard of this brand. Have you? Softsoap | Nutri Serums Vitamin C Body Wash (full size retails for $8.00): I really do love getting sample sized shower gels and body soaps in my beauty boxes. These are so perfect for travel! I have always like Softsoap products and think that this scent in particular is so fresh! Garnier Fructis | Daily Care Fortifying Shampoo (full size retails for $3.99): I do wish that I got both the shampoo and conditioner...as I always like to "match scents". Is anyone else like this? Anyways, I am still interested in trying it! The formula contains antioxidants and proteins. What a great box this month!!! I think Beauty Box Five really hit the mark with the assortment of products...I mean: nails, lashes, body, hair, and eye shadow? They covered all bases! Plus, who doesn't like to play around with some new makeup colors! :) Fun, fun!! !